HANOVER PARK, Ill. (WLS) -- Hanover Park police made an arrest in Monday's fatal crash that killed a motorcycle rider at Army Trail and County Farm roads. A 30-year-old woman was killed Monday night after she was thrown from a motorcycle in a hit-and-run crash in west suburban Hanover Park, police said. 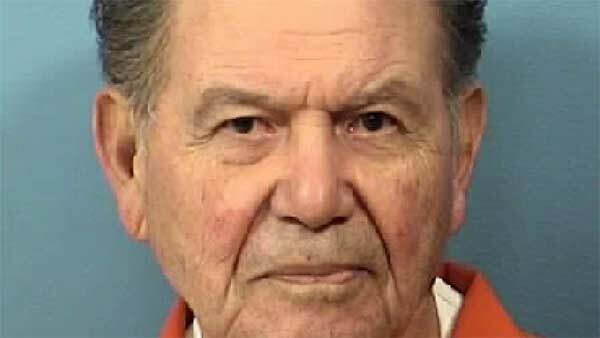 Ramon M. Barajas, 83, of West Chicago, has been charged with leaving the scene of an accident involving a death and one count of failure to yield turning left. Barajas was transported to the DuPage County Jail where he appeared at a bond hearing on Wednesday. Barajas's bond was set at $50,000. Witnesses said a driver in a tan or gold vehicle, possibly a Mercury, struck a motorcycle just after 8:20 p.m. Monday near the intersection and sped off. "It's a tough intersection, a lot of people are racing yellows, racing through a yellow turning red is where people are getting hit," said Kevin Franz, who passed the scene Monday night. First responders found a woman lying on the road, unresponsive. She was pronounced dead at the scene and transported to the DuPage County morgue. "As I went by the emergency vehicles, there was a motorcycle that was really badly smashed up," Franz said. The victim was identified to authorities as Christina Jankowski, of Elmhurst. Preliminary investigation shows she suffered massive head trauma. The final cause and manner of death are pending toxicology and autopsy results, police said. Witnesses said the driver who hit Jankowski may have been wearing a baseball cap, and didn't bother to stop and help her. "It's disturbing. I ride a motorcycle myself, and you always hate to see, obviously, something like that happen and someone leave the scene," Franz said. Police said vehicle would have front-end damage and possibly a broken window on the passenger side. The DuPage Crash Reconstruction Team and Hanover Park police are investigating the crash. They hope surveillance cameras from nearby businesses captured video of the crash. Anyone who has information on the crash, the vehicle or the driver involved should call Lt. Matt Riedel at the Hanover Park Police Department at 630-823-5521.